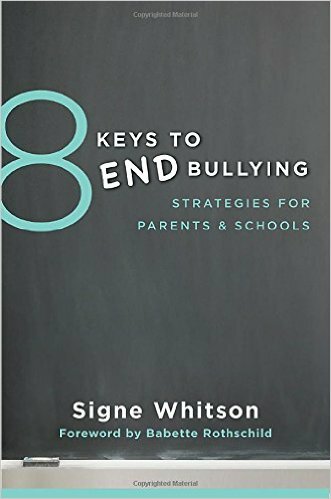 I recently read Eight Keys to End Bullying: Strategies for Parents and Schools by Signe Whitson. This author takes the familiar secular stance of attempting to explain away unkindness apart from a sinful nature. The term bullying is a relatively new term for an age-old problem: selfishness. Kids have been mean to each other since Cain and Abel. Had those boys lived today, would we call Cain’s actions bullying? Probably so. But the point is that the underlying cause of unkindness has been around since the Garden of Eden. This book would be a lot shorter if the truth about the nature of people was the main premise: We are sinful creatures capable of great selfishness, and this flaw in the human heart can only be addressed through a spiritual relationship with Jesus Christ. Does bullying exist in Christian education? Absolutely. And it has since Adam blamed Eve for his sin. However, we don’t have to make up a special name for it. We just call it what it is: selfishness. In their immaturity, children are especially prone to being self-centered, and this monster rears its ugly head in many ways: cruel words, harsh language, and hurtful actions. These are the nasty outgrowths of our fallen nature, and we parents have dried many tears on the cheeks of our little ones as they regale us with stories of mistreatment. We’ve all seen it, and it’s nothing new. Whitson offers a multitude of practical lists on handling the symptoms of bullying while never truly addressing the cause of the problem. This is a common approach in secular writing (especially in psychology) but one that only places a band-aid on a life-threatening wound. Wouldn’t paretns and educators be wiser to offer long-term, life-changing help to young people, rather than merely helping them manage the pressures? Whitson’s approach, and the predominant secular mentality, is that everyone is owed an apology for being mistreated. Certainly, if a someone selfishly mistreats another person, he or she ought to restore that broken relationship with an appropriate apology. But let’s say the bully doesn’t apologize? What then? How does the “victim” respond? Does life stand still? Secular wisdom would have people linger on hurt and blame any subsequent poor life choices on unresolved mistreatment. In other words, secular wisdom encourages individuals to be victims rather than overcomers, hurters rather than healers, grudge-bearers rather than forgivers. These are not wise long-term plans. The option to forgive and move forward is one of the greatest gifts that Christ gave us, and this life-changing realization does just that: it changes lives. This certainly does not relieve my offender of guilt or responsibility. However, it does move my focus off of depending on someone else and onto the only person I can control: ME. When a person internalizes this truth, it becomes a very practical and liberating force. Encouraging students to rise above circumstances and overcome actual or perceived wrongs through the power of the Spirit of God equips them to free themselves of otherwise besetting issues. The alternative? A life stymied by self-pity and resentment in which everybody else is the problem. Will we ever “end” bullying? It’s doubtful, but that certainly doesn’t mean we should stop trying or give up on controlling wrong actions. However, we also know that as long as there are people, there will be selfish behavior. Therefore, parents and educators should provide a much more valuable service to young people by teaching them to deal with the one thing they can control…their response.